March 8, 2007 - The ConnectEdu Team did a fantastic job of illustrating the paper processing issues that face college admissions officers, high school guidance counselors and students this past week at the AACRAO conference, held here in Boston. 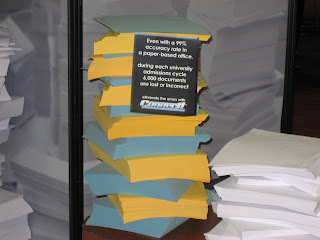 By stacking 123,000 pieces of paper in the ConnectEdu booth, admissions officers couldn’t help but take notice. And it’s not surprising that Tom De Santes and Mike O’Connor (the CDU team members responsible for the booth design) came up with such a dramatic representation of the problem. Prior to joining ConnectEdu, De Santes worked as a Vice President of Enrollment Management and O’Connor as a Director of Admissions. Their only regret was that they were only able to stack 123,000 pieces of paper, which pales in comparsion to the actual paper they received at their institutions. In fact, many of ConnectEdu’s college partners receive closer to 600,000 pieces of paper each admissions cycle that must then be processed … and often times copies are made of this inbound paper which further exacerbates the problem. 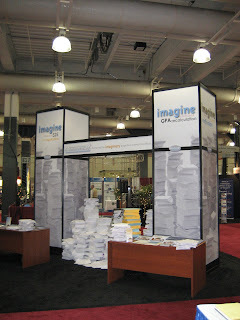 The 123,000 pieces of paper that ConnectEdu stacked into the exhibit hall served as a small, but very visible reminder of the problems that face all involved with the college admissions process. It is time for college admissions to come out of the dark ages and move into a truly electronic (not a PDF, paper) process. ConnectEdu stands ready to make this happen for more college partners just as we have for the University of Michigan, Michigan State University, University of Connecticut and several other leaders within the enrollment management industry.